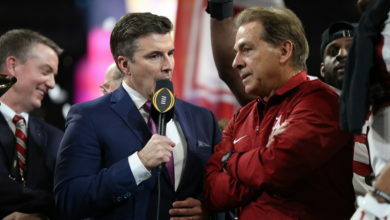 National Championship Caps Exciting College Football Playoff Which Delivers Ratings Growth, Sets Numerous Streaming Records - ESPN Press Room U.S. The College Football Playoff (Semifinals + National Championship) averaged a 12.7 overnight rating and a streaming audience of 535,000 average viewers, 1,655,000 unique viewers watching 120,090,000 minutes. The three game overnight average is up 8% from last season’s same three games and streaming audience is up 39%, 25%, 38%, respectively, in average minute audience, unique viewers and total minutes watched. The streaming average is the best in the three years of the College Football Playoff – in all three metrics – surpassing the first year by 100%, 65%, and 98%, respectively. Factoring in the entire New Year’s Six, the seven games (New Year’s Six + Championship) averaged a 9.0 overnight and a streaming audience of 355,000 average viewers, 1,155,000 unique viewers watching 79,095,000 minutes. The overnight average is up 8% from last season and streaming audience is up 49%, 30%, 48%, respectively, in average audience minute audience, unique viewers and total minutes watched. The streaming average is the best in the three years of the new system – in all three metrics – surpassing the first year by 132%, 96%, and 130%, respectively. The College Football Playoff National Championship Presented by AT&T between Clemson and Alabama (January 9, 2017) set streaming records for the third consecutive year. The Tigers’ victory had a streaming average audience of 710,000 viewers with 2,413,000 unique viewers watching 182,575,000 minutes – setting new highs in all three categories for a college football game on any ESPN network and surpassing last season’s national championship game between the same teams (January 11, 2016). The streaming audience was up 21%, 25% and 30%, respectively, in average minute audience, unique viewers and total minutes watched from the before mentioned 2016 CFP National Championship. The unique viewers is ESPN’s third best across all sports, trailing only two USA World Cup games which were played during traditional working hours. ESPN’s record-breaking national championship streaming audience concludes a 10-day stretch which delivered the most streamed semifinal (Chick-fil-A Peach Bowl featuring Washington vs. Alabama) and non-semifinal New Year’s Six game (Rose Bowl Game Presented by Northwestern Mutual featuring USC vs. Penn State) ever. New Year’s Six consists of Capital One Orange Bowl, Chick-fil-A Peach Bowl, PlayStation Fiesta Bowl, Goodyear Cotton Bowl Classic, Rose Bowl Game Presented by Northwestern Mutual and Allstate Sugar Bowl. Each year, two of the games are College Football Playoff Semifinals.